View highlights and catch up with speaking engagements attended by André Pienaar, entrepreneur and Managing Partner and Founder of C5 here. 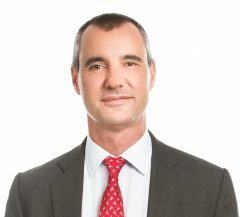 Derek Maltz was Special Agent and former chief of the Special Operations Division of the U.S. Drug Enforcement Agency – a component of the U.S. Department of Justice – from 2005-2014. Mr Maltz has extensive experience in tackling transnational organized crime. From 2008 he led Project Cassandra – an ambitious U.S. led law enforcement campaign to target drug trafficking by Hezbollah. His expertise has been widely relied on by the US Congress. During an exclusive CMEC event in the Houses of Parliament, Maltz spoke in detail about the large transnational networks and often local characters which help fuel the illegal drug industry and redirect funds towards terrorist networks elsewhere in the world. Later, speaking to Conservative Middle East Council Director Charlotte Leslie, Maltz emphasied how this new evidence presents a challenge to law enforcement agents and policy makers around the globe and helps expose the extent to which recreational drug use, in Europe more often than not, inadvertently helps fund global atrocities. C5, the investment specialist firm focused on cyber security, cloud computing and artificial intelligence, has announced the winners of its inaugural Shield in the Cloud competition. The challenge, supported by Amazon Web Services (AWS), PeaceTech Lab, and SAP NS2, was created to bring together the best and brightest minds working in anti-corruption technology. The awards gala was held at C5’s PeaceTech Accelerator in Washington D.C. General Keith Alexander, founder of the United States Cyber Command, former Commander of the US National Security Agency (NSA) and current Chief Executive Officer of IronNet Cybersecurity gave the keynote speech. The General spoke about the work being done by the NSA to combat corruption, both at home in the US, and internationally. Also speaking at the event was André Pienaar, Founder of C5 Capital, who drew attention to the work of C5’s PeaceTech Accelerator. In his speech, André spoke about the concept behind peace technology. Explaining how the advent of cloud computing has brought about an era in which computing infrastructure can be used for everyone’s benefit, with PeaceTech being the purposeful application of the innovation that cloud computing enables. You can find a full transcript of André Pienaar’s speech here. Speakers at the event awarded prizes in three categories: Dream Big, Not for Profit and Government. The Special Operations Division (SOD) of the US Drug Enforcement Agency (DEA) and Citibank also received special recognition awards. The DEA were recognised for building an innovative model to combat the linkage between corruption, narcotics and terrorist finance, and Citibank for their support of global technology innovation through their Tech4Integrity programme. A total of 61 organisations connected with the challenge. A panel of expert judges then created a shortlist of 24 before selecting the winners. The full shortlist can be seen here. Prize winners will receive AWS cloud credits and the option of taking a place at C5’s PeaceTech Accelerator in Washington D.C. to further develop their products under the guidance of C5, AWS, SAP NS2 and PeaceTech Lab mentors. It gives me great pleasure to welcome so many friends and partners of the Peacetech Accelerator to our awards dinner for the Shield in the Cloud global anti-corruption challenge. Why did C5, a specialist venture capital firm; Amazon, the world’s leading cloud computing company; SAP NS2, the world’s largest software company; the Peacetech Lab; and the US Institute for Peace partner to launch the first global anti- corruption innovation challenge? Why are innovation and corruption two diametrically opposing forces? Why does collective security matters? Why is corruption corrosive to our national security? What is Peacetech? And why did we call this challenge Shield in the Cloud? I had the privilege of growing up in the arid beauty of the Karoo desert in South Africa. In the Karoo, when you see a cloud, it is good news, because it carries the promise of rain that transforms the desert into the bloom of the brilliant colours of many flowers. Similarly, cloud computing today is transforming our world with unprecedented opportunities for innovation and entrepreneurship. What is cloud? Cloud is taking the computing power we have come to know first on our personal computers and on premise servers, and industrializing its capacity with computing infrastructure on a global scale for everyone’s benefit. Amazon pioneered this by investing billions of dollars to build multiple industrial size computing centres around the world, and networking them cost effectively with high speed fibre optic cables. This means that we need less capital and less infrastructure to grow organizations. We can displace capital with technology to build, scale and innovate globally on an unprecedented scale. Cloud computing is an integral part of the U.S.’ leadership of the global economy and the free world today. The U.S. not only created cloud computing, but continues to lead and innovate cloud. The first fifteen cloud computing companies in the world today are all American. Cloud computing’s power to scale innovation, to reduce the cost of computing, and to increase its accessibility to everyone is increasingly one of the drivers of growth in the global economy. Cloud will become as important to the stability of the global economy as the U.S. dollar is as our global reserve currency. How does PeaceTech fit into cloud? At C5, as investors, we have to look for the far horizons. Since we are the custodians not only of our own money, but also that of others, we have to think like stewards. This is why Peacetech matters to us at C5. Peacetech is the purposeful application of the innovation that cloud computing enables for good and not for evil. Peacetech is the strategic application of cloud-enabled innovation to sustain national and international security gains, build a strong peace and secure our children’s future. It is this unprecedented opportunity that led us to launch the first global anti-corruption challenge to focus on a pillar of strong peace- combatting corruption. A strong and lasting peace in post conflict countries is not possible without good governance. Why are Innovation and Corruption Two Opposing Forces? In our experience as venture capital investors in Europe, the Middle East and Africa, corruption and innovation are opposing forces. Where one is present, the other is invariably absent. Innovation thrives on good governance. On the other hand, the destructive economics of corruption kill innovation and opportunity. It wastes the talent of entire generations. In leading this challenge we want to strengthen the virtuous cycle between good governance, innovation and opportunity, which the entrepreneurs with whom we partner as investors need to thrive. Why is Collective Security the Best Security Model for the 21st Century? One of the purposes of the global challenge is to find and support the leaders who are innovators in the fight against corruption and its causes. Fighting organised corruption is one of the loneliest tasks. Invariably, perpetrators seek to isolate, target, and diminish those working towards the greater good. The same perpetrators often have reach, hiring lawyers, investigators and public relations advisers of their own. The bigger the syndicate, the further their influence extends. With the Shield in the Cloud global challenge, we want to connect organizations fighting corruption to build collective security. We also want to accelerate the pace of anti-corruption innovation by sharing best practices across this network. It is our great privilege to have several leaders and innovators with us present here tonight who are helping to build good governance and combat corruption from around the world. In expressing our gratitude to these leaders tonight, we are also expressing our gratitude and appreciation to everyone involved in fighting for this great cause, as well as those who are not with us tonight. We are honouring them for their courage even in their absence. Why is Corruption Corrosive the National Security? Finally, in leading this challenge we want to highlight the threat of corruption. Increasingly it is a damaging effluence from the toxic stream of illegal narcotics that is flooding global trade routes to poison our nations. These same illicit global trading routes and networks that carry heroin, cocaine and opioids across them, carry multiple threats, ranging from human trafficking to terrorist finance. These same illicit trading networks are exploited by state actors like North Korea to destabilize national and regional security. They increasingly form part of the lines of attack that adversaries are pursuing against our nations, while camouflaging their deadly hostile intent in a twilight between war and peace. This clear and present danger and the complexity of its threat require new tools and models to combat it. A vivid illustration of this phenomenon is the largest heroin case in history, which the US Department of Justice and the Drug Enforcement Agency are prosecuting in the Southern District Court of New York right now against an East African syndicate. This case involves a group called the Akasha brothers which attempted to smuggle 99kg of heroin into the US. The heroin was sourced from the Taliban in Afghanistan by a drug lord based in the UK posing as a legitimate Gulf-based businessman. The heroin supply was clandestinely transported from Afghanistan through Pakistan, and concealed in oil tankers to East Africa for onward shipment to the US and Europe. The syndicate used modern technology to evade detection including Skype and encrypted USB sticks. Along the way, its drug trade and money laundering helped to fuel conflicts in multiple countries in different ways- from the Taliban in Afghanistan, terrorist organizations in Pakistan, ethnic violence in Kenya, to state capture in South Africa. The syndicate was too big for a single state to combat. It required a law enforcement alliance using new tools and methods. Only the innovation and persistence of the Special Operations Division (SOD) of the DEA brought them to justice in the US. This case is a vivid illustration of why we are honouring the SOD for bold leadership in the fight against corruption. In honouring these leaders tonight we ask you to join us in this challenge and invest alongside us in the future to innovate the fight against corruption. courage to assume the ultimate responsibility for peace. context of humanity and dignity of all of his people and indeed of humankind”. recording of the event below. 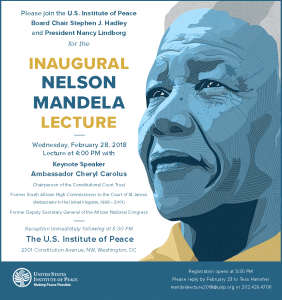 that the Nelson Mandela Lecture will go on to take place on an annual basis. C5 Accelerate hosts 150 leaders in impact investing, social entrepreneurship and peacebuilding at Washington D.C.
Washington D.C. 23rd January, 2018 – C5, the specialist technology investment group with offices in Washington, London, Munich, Luxembourg and Bahrain, has partnered with the IPSI Institute and Creative Learning to host Venture Peacebuilding Symposium participants in Washington D.C. In partnership with the PeaceTech Lab, Amazon Web Services and SAP NS2, C5 has established the world’s first Peacetech Accelerator in Washington D.C. to scale startups on the cloud to solve problems relating to peace, stability and security worldwide. The participants of the Venture Peacebuilding Symposium are gathering in the afternoon of 23rd January to discuss how innovation can improve efforts to create a more peaceful and sustainable society. Symposium attendees will meet with more than 17 peace ventures, including Accelerator alumni and current cohort companies, comprising entrepreneurs from all over the globe. These entrepreneurs are working in a wide range of spheres to improve the lives of civilians in conflict and danger zones, develop lasting solutions to build peace, and to effect a demonstrable social impact in communities and among refugees. ICMEC – advocating, training and collaborating to eradicate child abduction, sexual abuse and exploitation. OneRelief App – revolutionizing charitable donations through an app that collects micro-donations for humanitarian relief aid. Pennywell – using small change to make a big difference. SEaB Energy – the leading small waste-to-energy product. Transforming your waste on-site to make energy and fertiliser. SuperFluid Labs – bringing tomorrow’s analytics capabilities to businesses today. TerraBlue XT – building a complete Internet of Things (IoT) ecosystem, consisting of proprietary hardware and software to address key gaps in the understanding and management of chronic and neurological disorders. Solution Architect for Amazon Web Services. Cyber security for non-profit companies is an often overlooked topic, but as André explains, cloud computing is part of the solution. Joe Spiezio notes that while non-profits often don’t have the time or resources to dedicate to security, the number of large corporations already using the cloud can benefit smaller non-profit companies. This is because larger corporations in industries such as finance and healthcare have stringent security requirements, allowing smaller companies and non-profits to leverage what’s already been put in place and focus their resources on higher level issues. Asked by André what her perspective on cyber security is, Maura Harty says that the relationship between databases and donor information within non-profit companies is critical. Maura explained that if this data is breached in any way, they risk losing donors and there would also be a cascading effect across many other donor relationships. Although there are some costs associated with investing in cyber security, Maura advises that this is necessary because without the donors, they would be out of business. should educate themselves and understand where the biggest risks and vulnerabilities within their company might lie, and take action to mitigate these risks. and André’s thoughts on AWS, along with John Furrier and John Walls. secure with holding data in the cloud. models for securing and processing data. that run on the AWS cloud.